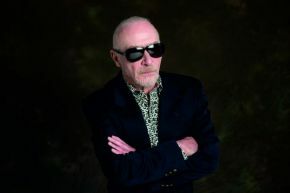 Regarded as one of the UK's most distinguished and original songwriters Graham Parker returns with a new studio album and UK tour in October. The album will be released on 100% Records. Best known as lead singer of Graham & The Rumour who preceded the arrival of punk rock and new wave, his career has spanned over 40 years and was recently reinvigorated when acclaimed US film producer and director Judd Apatow cast Parker in his hit film 'This Is 40', featuring a performance by GP & The Rumour that signalled the band to reform to play a series of now legendary come back concerts. His new line up - Graham Parker & The Gold Tops will be joined by The Rumour Brass band will perform a set of classic Parker songs alongside new music being performed for the first time. The first song from the new album, Dreamin' has recently been featured in a new Netflix series, Love - again directed by Apatow. South Devon's finest singer-songwriter with a soulful, slightly gravely voice. A lot of his songs feature acoustic guitar and occasionally harmonica. He beautifully blends early 70s folk rock and 60s wistfulness with a touch of Nick Drake and Elliot Smith. Fans of early Rod Stewart, Tim Hardin and Credence Clearwater Revival will find much to like, too. Jon's song writing is melodic and many of his songs could have been written at any time in the last thirty years, they sound like such classics.